My Time At Portia leaves early access and launches on PC on January 15th 2019! Sort of tempted to buy it before the release and price increase but I know I wouldn't get to it for months with my backlog + new releases. So it's looking like a steam summer sale purchase. It looks very interesting though. That was fast. I feel like I played the alpha last year. How much content does this game have? Dammit, i wasn't going to go for this just yet but i can get a Steam key for under a tenner and this looks really relaxing which is what i want from gaming right now. I haven't succumbed yet... Tetris Effect and GDQ are keeping me distracted. hahaha ... well good luck with that then! It has a 22% discount on GMG so I bought a copy for my gf. I would have grabbed one myself but I don't know when I'll be able to get to it with all these games. I still haven't touched anything from the winter sale really. Hopefully the new version works for me. I spent an hour last night trying to get past a Unity3D Directx 11 crash and nothing i tried could stop it. After 5 minutes i get a screen crash. The music plays and the sounds of the interface are working but the game screen has frozen and a crash dialog is hidden in the background. I tried forcing Directx9 and single threading but neither seemed to be recognized according to the logs. can we just turn this into OT? who else is playing this? Fingers crossed i'll be playing it tonight! I told you to play Stardew Valley first! I'm really tempted to recreate my femshep from ME 1-3 but i'll proably go with a "likeness" as i have zero artistic skills. Edit: Now it just crashes 10 minutes in. At least i have a save point so i can keep trying things out before submitting a report. I caved and bought the game as well. I've never played something like this, but lately I'm been more interested in relaxing games, so I'll give it a try! in other news, it was late yesterday, I was sleepy and somehow skipped, didn't read a dungeon tutorial... and apparently that was not a thing to skip. suiko If i can get the game to work for long enough to create a character i'll post a screengrab. I have no problems with a game so far? why you can't get it work? I have an AMD Ryzen 7 2700X, 32Gb of Ram and an 8Gb GTX 1070. I should be okay... but it crashes either at launch or 10 minutes in. Either a CTD or the screen hangs but everything is running in the background. I think my machine is too beefy for Unity. I think it's the old problem of Unity's multi-threading being dreadful especially with DirectX11. I've tried the force DX9 and force single threading command line args and they seem to be ignored. I was really enjoying the first 10 minutes until i had to do them 6 times in a row due to the game crashing DirectX11. 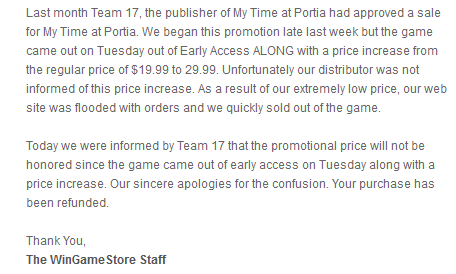 Turns out the deal on GMG for the game was 1 time per account only. The sale is over but it's still listed at $20 and it still won't let me buy it again lol. I'm going to take this as a sign from the universe to stop buying things for a while. I really want fast travel option, hopefully there will be some in a future, Portia is not so small to run around all the time. Anyway, got some skills, half done with my workshop equipment, things are looking good atm. Apparently there is sort of farming in this game, but it's very different from usual stuff. Will do fishing tomorrow, first need to get more bait. And I'm not making money, what is of concern, as everything as expected is expensive and there are more games to play but again not free. EdwardTivrusky , have you tried contacting devs, they explicitly say to do so and are active on boards too. Derrick01 , so what? you are letting universe just bully you?! suiko I'm going to do so tomorrow. I've zipped up the crash/save data folder with a DXDiag report and will look into submitting a report. I had some more luck today and managed to play about 30+ minutes before a CTD. I don't think there's much more i can do on my side of things so hopefully my report helps. It's a shame as it definitely seems like the kind of game i'll happily pootle around in for hours. I'm in no rush, I've plenty of other games on the go and i'll happily jump back in again when there's some feedback to test. For now I am. If I can find a similar deal without making a new account somewhere maybe I'll get it but otherwise I'll probably wait for the summer sale. Got an email from Wingamestore, apparently the price on the website was not correct and they're in contact with Team 17 to decide if they should honor the orders or not. They should have an answer later today. I guess the same happened with Gamebillet. Thanks to this thread, I bought this, seems really charming and relaxing so far with lots to do. Can't wait to dive in more. Amount of various items is shocking, I must say. My bad for trying to get it on the last day of EA, but kinda of a bummer. Yep, received the same email from WinGameStore. As I already decided that I would try it, I just bought it from another store. I should finally be able to try it this week-end! only 10K of steam people are into fun? I'm hoping to play the game a bit this weekend. I have been sick for the past few days, so I haven't played anything this week. I backed the game on Kickstarter, but I was waiting for version 1.0, in order to start playing it. Just curious, how does this final, release version compare to, say, Animal Crossing? I know there is more to this game than AC, like dungeons/weapons/quests, but what similarities are there between the games? Are there unlockables/collectables in the game like on AC (things like new music, items, ...)? I'm pretty early into a game, so I can't tell you much besides that it has insane amount of content, there are collectibles, called relics, as you get only parts of those, and then combine to get a whole thing, it will be a truly titanic task to get 100% in this game, could be not possible if RNG treats you the way it usually treats me. I wouldn't say it's like AC, well partly, partly as Rune Factory and there are some similarities with Stardew Valley too. One thing it's clear, it's such a lovable game, but it's no short fix kinda of a game, I expect I'll be playing this one for months and it's OK.